Recycling plastic is probably the most confusing process in the recycling world. There are just so many types of plastic that some may throw up their hands and just chuck all of it into the dumpster. That is certainly a shame when so much of it is recyclable. Just in case you’re that kind of person, below is a list of plastics that can be put into those plastic blue bins. 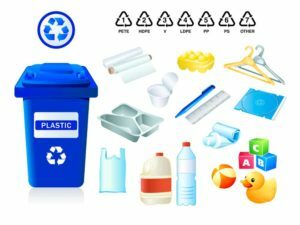 Fortunately it is easy to locate plastic recycling near me, but know what can and cannot be recycled is where it gets a bit confusing. Here is some information on the different types of plastic. Any plastics numbered 1 thru 7. Please make sure that you at least wipe out these items. Washing them thoroughly is wasting too much water. Plastic is an insanely durable material that resists decomposition, with a presumed life span of over 500 years. It’s safe to say that every bottle you’ve ever used is still somewhere on the planet, although not necessarily in its original form. Plastic bottles get sold, shipped, melted, resold, and shipped again, sometimes crossing the entire planet. Many recycling plants sort, recover and then discard the unusable materials. Often times, this is due to people not knowing what is truly recyclable. An average of 50% of what gets put into a recycling bin never gets recycled. So, again, it’s very important to become knowledgeable about exactly what goes into those blue bins. It’s incredibly important since plastic is in everything; it’s in your car, your home, etc. However, recycling won’t be successful unless it is mandated by federal law that every state should have a deposit system. Incentives have shown to work, as well. In California, there is a legislated deposit system, and enjoys a 65-70% recycling rate. Whereas in a state like Texas, that has no bottle deposit, the recycling rate hovers around 5%. That is an incredible difference. Other countries have gone even further and have put into affect an extended producer responsibility, or EPR on manufacturers of single-use products. A great example of this is Green Dot, out of Germany, although it is now law in 50 countries around the world, which requires companies to pay for the environmental cost of their packaging businesses. This could be very important for a country like the U.S. where only 31% of its plastic beverage bottles get recycled, and the rest ends up in a landfill, or on the ground, or makes its long journey out to sea. Whatever your reasons are for recycling, whether it is to make some extra cash, or help the environment, or both perhaps; it should be the responsibility of everyone to lend that extra hand. Many years from now when future generations look back at all the materials that we buried in the ground, they may simply think how silly we were for filling our landfills with resources. So, get to a plastic recycling facility near you and put that plastic to good use.